CNG: eAuction 169. SICILY, Gela. Circa 480/75-475/70 BC. 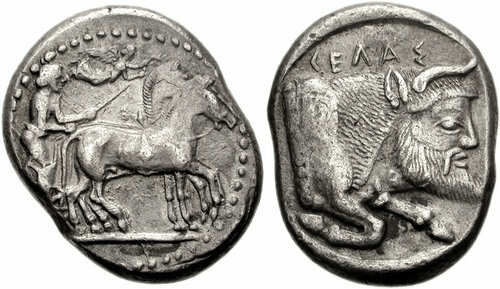 AR Tetradrachm (23mm, 17.15 g). 169, Lot: 12. Estimate $750. SICILY, Gela. Circa 480/75-475/70 BC. AR Tetradrachm (23mm, 17.15 g). Charioteer driving quadriga right; Nike flying above crowning horses / Forepart of man-headed bull right. Jenkins 183 (O49/R104). VF, a few deposits. Ex Triton II (1-2 December 1998), lot 156. Although the city was a Creto-Rhodian foundation of the seventh century BC, the name of the river and later the city is of local Sicanian origin, meaning very cold, as the water is, running from the Heraei mountains to the north. The rather brutal half-length figure of the man-faced bull swimming right is based on the 'father of all rivers', Achelous, and is clearly identified by the ethnic Gelas as the personification of the river rushing to its mouth,where the city Gela stood. It was defined by Virgil (Aen. 3, 702) as 'immanisque Gela fluvii cognomina dicta'. The charioteer is a reminder of the tyrant Gelon’s Olympic win in 488 BC, a few years before his conquest of Syracuse. The type became a common symbol for both cities under his rule.